On Friday I was in Edinburgh and took the opportunity to join Ed Taylor of the Princes Foundation on a visit to the carpenters who are working on the new shelter for Gordon Park, Ellon. 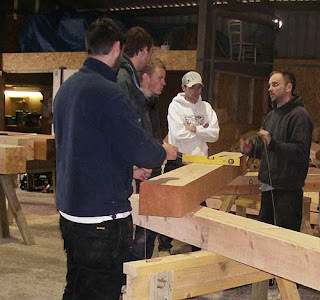 The shelter is a gift to the town from the Princes Foundation with much of the work being done by the trainees who will be working in wood, stone and slate as the shelter is built. The photos may give you some idea of the scale of the work. 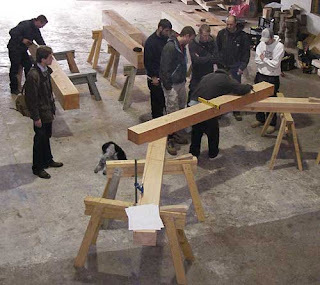 The two master craftsmen, Jack MacGregor and Luke Mallet of Alba Green Oak Frames, are busy passing onto six apprentices some of the art of their craft. The octagonal shelter involves some interesting angles! The guys will be one site next week so do call part to say hello. My God Debra you actually engage in something that has nothing to do with Menie? Did you cycle to Edinburgh? No? but i bet you charged it to your Council expenses. Another unnecessary trip. A little more added to your 10.2 tonnes of CO2. I went to Edinburgh for the Gude Cause March - a celebration of our democracy. I travelled by train (Thank you well know supermarket beginning with S ona £15 return trip deal) at my own expenses. Why was your trip deemed unnecessary? The trip had a clear and defined purpose which was to celebrate and honour the centenary of the march through Edinburgh in 1909 of the suffragettes, without which women would not have the vote. It was the re-enactment of a step on the journey towards democracy which this country took 100 years ago. 2ndly the train was going that way anyway so the more passengers the better...had you gone by car that accusation could have been levelled at you and... as for expenses well in the post Westminster scandal era all public servants expenses are being carefully scrutinised in the court of public opinion. Clearly some people have no idea of, or interest in the Social and Political History of Scotland and the UK. Similarly others like me have no idea what people see in fast cars or playing golf but hey each to his or her own. I've just counted. there are currently 75 posts on this site. 17 relate to Menie in some shape or form. Not excessive, I feel.